Hi My Friend! How are you? How has this new year been treating you so far? I went with Clint to the Huntsman Cancer Hospital for various appointments. "I am taking on this challenge to find solutions to get rid of the unwanted, rendering weight. I challenge you to find the challenges or excuses that have stopped you from accomplishing something you want to achieve and treat those excuses like a problem that can be solved! I have never thought as myself as someone that inspires others. I am a man a few inspirational words and when I have been in a leadership role, have always tried to lead by example. I, like most people have challenges. These challenges have given me excuses that have rendered me from being the person I want to be. I have made the realization that an excuse is problem that can be solved! My physical challenges have caused me to be unable to manage my weight. This is a huge problem for me. My doctor lets me know every time that I see him that my excess weight will shorten the life of my body. Kamille has done her best in finding solutions to help me be able to get active without causing further injury to my recovering body. But ultimately the effort and decisions are all on me. Lucky for me I am married to my hero and inspiration. You might have to think outside the box like me. Anything that is worth accomplishing is worth working for. And hard work always pays off. But in the counsel of the Doctors 'Work smarter not harder.' I am including you on my journey (to mostly give me an audience to be accountable to) but also in hopes of helping someone else that have what seems to be insurmountable challenges to let you know you are not alone. 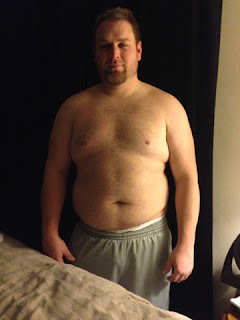 So here I am January 2013 240lbs Month 1 of my Get Fit- Get Healthy Challenge. Feel free to comment with any questions....."
"The purpose of a Marathon is to have your spirit and mind tell your body it can go on even when it wants to stop. Clint you've already ran Marathons! Your mind and spirit have carried your body many times. You are strong....you can do this!" Isn't that a neat way of looking at it? I thought it was too! What would you like to be better at? What challenges do you have? I'm so proud to cal you both my friend! You guys inspire me everyday! Good luck Clint! I know you can do it!